I sometimes feel like the monk pictured, hemmed in by high stone walls, but yet in the light and trodding the narrow path. It is ironic. We travel the stony, narrow path…but the same straitened way leads us to…as the Psalmist says…a spacious, broad place. Yes, glory to Him! Dean, I could be wrong, but I thought that was a picture of Fr Stephen from behind while on his trip to Mt. Athos. See the back pack? Good guess! But it’s me in Jerusalem in 2008. Oh thank you Father….like a fool I am moved to tears! Great is our God…so wondrous and full of Mercy! Even irony is made to be good! Father will have to tell us. If it’s him on Athos, he was a temporary monk for the stay! I’ve seen monks with rucksacks, dressed in some strange ways…straw hats, pipes, tattered work cassocks…in the world but not of it. Glory to God that He does not leave us as we are! His forgiveness is healing. – Are you familiar with integrals (sums – a pretty advanced part of mathematics), my son? – Integrals? No, said the youth. – That’s a shame because I could prove it using integrals! Glory to God for all things, mathematical, ironic and needing no exegesis other than the Cross and Resurrection of Christ. Excellent post as always. I find myself pondering why you selected that picture for this post. I could read a lot into it, but what were your thoughts? I’m beginning to see the irony of admitting our failures is the only path to empathy and choosing to embrace others, in the irony of their contradictions, is what love is. How is it that the very things that poison our souls, are also our salvation? We sin, but if we choose not to admit it we can’t have empathy. Our irrational behavior towards one another doesn’t seem like a stable foundation for love to thrive in, but choosing to overlook another’s non-sensical behavior seems to be one of loves key factors. Why do we look for miracles, when we live them every day? 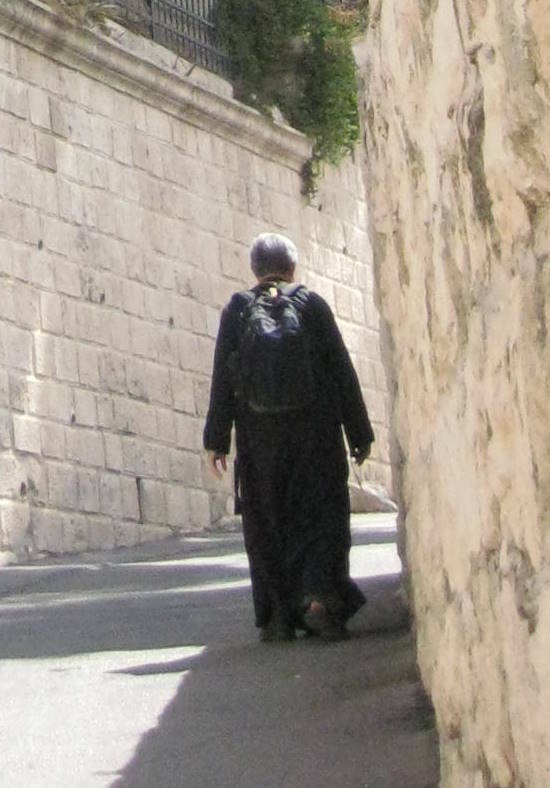 Some of us walk alone along a path in the woods, some of us walk alone along the edge of an ocean, and some of us walk alone along a narrow street in Jerusalem. In Christ we are never alone and we alll walk together. Our hearts are united in Christ and in each other, imperfect though we may be. I understand integrals. Im sure Dee does too. I would like to know how an anti-derivative proves God’s existence. Thomas B, thanks for that quote! Clever from the bishop – between basic arithmetic and calculus, mathematics is so much fluff, so seemingly irrelevant to real/daily life. However when you get to the point of being able to calculate the area under a curve, why you can build a bridge or an electrical circuit with that. Much in life (particularly the ascetical life) is exactly like that. Cliff, thanks for your post! Important subject father! Kierkegaard thought that one of the marks of modernity and the modern mind was its loss of any sense of or capability for irony. He said that what modern man needed was not so much Jesus, but Socrates because Socrates was the master of irony. Irony is that state in the mind which transcends the dialectic. Irony is the perspective which sees the insufficiency, the poverty of the dialectic. For a few years now I have been trying to consciously and ironically view things such as heaven and hell, good and evil, death and life – even such things as the male/female sexual binary in relation to ordination or marriage as between only a man and a women. Such things can not be resolved or concluded in a *reasonable* way – there is no causal A, then B, then C for the mind to grasp onto, only the ironic “mystery” to behold. I cannot find the quote now (though I think I used it in an article recently) – but someone said, “We only know anything by contradiction.” I took this to mean that in a field of unobstructed vision, with nothing to interrupt my sight, I would see only nothing. It’s when something “contradicts” my sight, or my line of sight, that I see it. Thus, everything we “see” is a contradiction of sorts – and when we fail to grant it the status of a contradiction, it is only because we are refusing to see it. It is as though it is not there. When we “encounter” someone, we see them because they are “not me.” This is that ironic mystery. Subtle, yet important to note, thank you for that! Our common history – Orthodox, Catholic, Protestant. Yes, quite right I believe. A friend of mine got this across to me when I was but a teenager (I intuitively got its relevance then somehow, though it took years to flush out its import) : we only “know” something by *contrast* – contrasting it against something else. His way of saying the same thing as you. This is the “dialectic” but only as a starting point, before the discursive mind “acts” and performs its essential divisive/summing/synthesis operation(s). This contrast/dialectic perception has its place in reality and life, but in-of-itself can not grasp the things of God because God is the creator of these things, and they have their meaning/relevance only in larger (much lager) Life and Providential end/movement. Only irony, which is the perception of the contrast while at the same time perceiving the insufficiency of the discursive minds “summing” action, can admit Providence (because the discursive mind can only see a “cause”, a chain – how ironic that a “chain” is the analogy used to describe the discursive mind!). All this is rather easy to state philosophicaly, but just as you say, to “bear it” with our very lives!?!? To consciously take up the Cross in all its import. That is, as an actual and lived suffering and death, not as a mere therapeutic “symbol” that we wear around our necks as if we really hold in our hearts and minds the real meaning of this torture device even 1% of the time – How to even begin such a thing? Who can bear this irony? It is only at this point that Christianity even begins its real *communication*. Everything before this is just so much therapeutic moralism, just as you say. Not to be contrary. I am so gratefull for my evangelical heritage. It brought me to Christ. Yet I don’t know how “common” it is with the 2 historic churches you mention. I spent two years in a Mennonite seminary yet still knew hardly anything of church history (much my own fault, I’m sure). Of course I knew there were 1,500 years of church before the Reformation, but thought most of those years were years the church was adrift in “catholic” error. I knew nothing of the Orthodox Church. So, the church that denied so much of history was, in a sense, that which eventually led me to Orthodoxy. Talk about ironic. Robert, unfortunately that time when the only Church history was Orthodox is no longer common even to us. It is a well into which all can reach, but without the correct approach it is doubtful if what is learned will be the same. I find that I am extending the premise here to include the violence of God in the annals of the Old Testament. Unlike some I have never been particularly troubled by that. In a multifaceted, non-dialectic world existing in God Himself it is not surprising. Perhaps the violence had no particular harm for those that suffered it, God knows. Simon, I suspect that if the young man had known integrals, the question would have been different. The point is that any “proof” of God requires knowledge I do not have. That is the irony don’t you think? Yet many are absolutely certain that God is and that He loves. That is evidence don’t you think? There was definitely a part of my inquiry into orthodoxy that was a search for the perfect church. I knew I shouldn’t, but I wanted it anyway… thankfully God threw me into the middle of various bumpy relationships in our little parish, and a close friend left the parish never to return due to conflicting spiritual advice. These things were hard for me to process but very good to experience before my baptism; I needed to know that I was entering the hospital of souls and not some kind of five star resort. To His closest ones, who loved and followed Him, He told everything (the Apostles). To those who He expected to receive His answer in simplicity and faith, He answered directly and plainly (as He did to the Samaritan woman and to the man just healed from lifelong blindness). To those who just wanted to test, trick or discredit Him, but didn’t really want to accept the answer, He answered with a question turned on them, refusing the direct answer (I will tell you if I who I am if you answer Me “The Baptism of John, was it from God or men?”). He knows our heart’s motivation, predisposition and response. I think we often are dishonest even with our own selves about it. We want God, but ‘not quite yet’, we want to be holy and follow Him, but ‘not quite yet’. I love that irony of grace – that even the “good” man is saved, but not by his goodness but in spite of it. I believe that the reason we find it so difficult to truly love others is because we continually expect them to be something that they are not. Christ’s love is wholly unconditional and accepts who we are in all our deficiencies and imperfections. May He help us to follow Him! Thank you Fr. Stephen for another beautiful offering. Here is a super-duper fun fact: One of the most influential essays ever written in science and evolutionary biology in particular was written by an Eastern Orthodox Christian. The essay “Nothing in Biology Makes Sense Except in the Light of Evolution” was written by the EOC Theodosius Dobzhansky!! This, I think, is your best post ever! David to me the unity comes from the reality of Creation: The Lord God made us all, including the rocks. He made DNA and as beyond mastery is able to produce constant variations on a theme. He then fills all things but to we humans alone did He share His image and likeness enabling the Incarnation. Theistic evolution for all it’s attractions and there are many seems to me to still be a bottom up approach that puts the created thing ahead of the Creator. Even more deeply, as our sister Dee has seen, is the death and Ressurection of JesusChrist “slain before the foundation of the world”. A mystery deeper even than time and growth and adaptation. Michael…Im glad that the incarnation guides your vision. But there is a gpod and proper place for understanding the world from the bottom-up. Every cure for every disease, all technology ever invented, everything from light switches to gasoline engines were created from the bottom-up. The incarnation doesnt replace the bottom-up approach any more than Christ indwelling in you does. But it enlightens it brings into the bigger picture. And whether you believe me or not theistic evolution does not place the creature ahead of the creator. Thats a matter of interpretation and if that is how you want to interpret it then its your right to do so. But that does not mean thats the way it is. But if the anthropic principle is real, then all of creation is ordered for us to find all the things you mentioned as they are revealed. All good things come down from above. The Incarnation also shows forth history as Providential. Revealed, not discovered; holistic not mechanistic certainly neither dialectic nor deterministic. Not arguing BTW just giving further explication and because it is certainly more practical at times to deal with the material mechanisms as we know them to be. I don’t know if it makes any difference as long as one loves God and seeks the truth above one’s own philosophy. Bless, Father! This article touches on a struggle I am having in my parish. An elder in my parish has taken it upon himself/herself to push me into voting for candidates that promote his/her ideals, I fear being too specific and missing the irony in the Lord’s forgiveness and mercy to me. I know from over 40 years of living that life experiences make some things more important to me than they are to others and vice versa. I pray for this person but I find it harder and harder to be in my parish and tithe towards his/her salary. I hate bringing this up. I’ve been Orthodox for ten years but Christian my whole life and never encountered a situation like this. Maybe I’ve lived in a political bubble until now. And I am struggling with how to show diffidence and forgiveness to elders whose words are in contradiction to what our hierarchs teach. What can I do? If I were in similar circumstances, I would tell the person (privately if appropriate) that you prefer to maintain your focus on God and not discuss the factions of men as that draws your attention from God. Then I would seek other conversations. If this person is a priest attempting to persuade political passions in his parish, it may be appropriate to seek the advice of a priest in your diocese outside your parish. Thank you, Dee. Just what I needed to read. The first paragraph you wrote is precisely what I thought the last time this person brought this up to me. But I didn’t say anything because this person’s age and title made me timid. I will follow your advice the next time this occurs as this is precisely what my gut told me to do a few months ago. This person is not a priest. Never be intimidated by men with religious titles. I give absolutely ZERO weight to religious authority. NONE. In fact, not only will I not respect someone for their authority, but the more authority they appear to have the more likely I am to actively disrespect them. There are priests and bishops who are scoundrels, for sure. Yet the majority that I have encountered in over 20 years deserve and get my respect. In Peter’s 1st epistle he notes, “Honor all men. Love the brotherhood. Fear God. Honor the emperor.” 2:17. I think Nero may have been emperor at the time! So, recognizing my own failures and follies, I will at least honor the office even if I cannot honor the person. Dean, I dont honor offices. I dont honor men. I have no respect to give anyone except for respect thats earned. Fear…fear is a different story. I fear the government. I fear law enforcement. Technically, I fear my ex-wife. So, there are many kinds of obedience I would render either out of fear or even praxis. But respect is like money. If you want it, then you you have to earn it. believe that the reason we find it so difficult to truly love others is because we continually expect them to be something that they are not. My Priest recently told me that we need to stop looking for a reason to love others (or “the other”) and simply do so. We are not called by Christ to love them “because”; we are simply called to love. Simon, the same may apply to your views on honoring others (“honor” and “fear” are often the same thing in scripture). The respect and honor we give them, and everyone, is due to the Image of God in which they are created, not the office. It is not “earned” but simply created. However it is very very difficult to practice this. We live in a time in which religious authority has been about as frequently abused as every other authority. I would not state it as strongly as Simon (though he has good reason to say what he does), but authority for its own sake is a coin that has pretty much lost all value. On the other hand, it is good in guarding our own heart, to work at not letting the passions of our own disappointments and such become powerful in our lives. My own disappointment, and not infrequent bitterness, towards every political party and their elected men and women, is a constant battle these days. We’re in a sort of meltdown (don’t quite know how to characterize it) that will likely become far worse (and I cannot add “until it gets better”). Christ Himself solemnly warned the disciples about “wolves” and such – a caveat that continued in the writings of the Apostles. The Church has never been free of such things. Though I’m loathe to use the word “earn,” when I think of respect, it nevertheless needs to be warranted. How about this? Ignore my comments. They were FOR Allison. To me, she seemed to be in a place where she felt intimidated by someone she perceived to have authority. I was hoping to encourage to not be afraid to stand up for herself and tp define and protect a healthy boundaries. Sometimes people need to hear that its okay to do that. She doesnt need permission. She doesnt need to write a letter to the pope. She can decide what that boundary is and then defend it against imposition. My actions and speech are always over the top and the benefit to that is…no body presses my boundaries. Nobody presumes to take advantage of me. I would hope the same for Allison. Well said – and quite to the point. Our spiritual dignity and the respect we get from others is generally proportionate to our own unconditional respect towards all. Every person merits respect as icons of Christ, no matter how distorted. Just as we venerate fine-looking, sparkling icons, as well as old, soiled and almost indiscernible ones (ignoring their blemishes and being noetically ‘transported’ to whomsoever is depicted), so too, we cannot focus on what negatives our critical mind sees in others but on what the Holy Spirit of love teaches us to see. The Holy Spirit (ironically) at one and the same time bestows immense discernment of what is in others as well as the view that they are (all) saints. There might rarely be times when certain treacherous persons might need to be pointed out as such to others who are beguiled, deceived or misinformed (for their protection), but that does not mean that we will not respect the image of God in them… The day such villains die for instance – eg perversion-promoting leaders or barbarously criminal politicians –we will not shout out in rejoicing or speak of the evil they did to all – instead we will remember that their soul is on a most difficult ‘journey’ and we will pray once again ‘Lord have mercy on me’ –where this ‘me’ includes them (and all of humanity with which we cannot possibly become separated). This is the Christian path. The wise as serpents and innocent as doves advise the perfect nutshell. This ‘serpentine wisdom and dove-like innocence’ should not just be an internal secret… It should be such that others feel it and respect the ‘distance’ we wisely keep and affirm, as well as the good-heartedness that we do not sacrifice in this watchfulness of ours. Some years ago I did some ministry with families who had lost a family member to murder or drunk-driving situations. They were estranged from their churches, and deeply broken and hurt. One of the most common stories among them was their pain at being told by well-meaning people that they needed to forgive their enemies (their child’s killer, etc.). However true it might have been, it’s timing was often deeply flawed, and failed to actually empathize with the pain they were enduring. It became a wall between them and God. My ministry with them began by affirming their anger and bitterness and rage – all of which were appropriate. And that became the beginning of a long, long process. I’m cautious about how quick we are to affirm the demand of forgiveness and love in certain settings – particularly when the person of whom we demand it has had their “boundary” completely obliterated by another. First, they need to be made whole. So, I’m adding that same caution here. Forgiveness and love are the deepest things we ever offer – and, are, ultimately a gift from God and not a moral act. My first concern for the wounded is to bind up the wound – establish the fact that it really is a wound – and help them recreate the boundary that has been violated. It is a very, very difficult thing within the soul. Mostly, I think we avoid this stuff because it is so terribly painful. Those who have been abused are first to be protected and made whole. A premature defense of the abuser simply feels like God has chosen sides – with those who abuse. Often, that was the very means an abuser used to belittle and crush the ones they abused. So, I’m very careful about this. It’s rarely good to tell the heart how it “ought” to feel. It’s rarely the right place to start. I apologize if my comments for Allison have been concerning to others. I am quite confident that no one here would ever deliberately hurt anyone. As far as my submission to authority goes…I do a lot of kneeling. I understand it’s important, but I am not going to kneel before just anybody. You have no idea how completely and utterly fed up I am with hearing about men imposing their will on women. Thank you Simon for your last comment in particular. The culture in the US and Western Europe— that which I’m most familiar —actively inculcates fairly brutish authority over women. Embedded in that form of socialization is sheer lack of respect or love toward women. I firmly believe this is at the core of why it is difficult to honor, with veneration, the icon of the Theotokos, among many American men and women. Why does that computer keep changing my name back?? Now everyone knows my secret identity. You’re Simon to us, dear brother, regardless of what your computer ‘says’. Dear Father Freeman and friends, I found this post a bit difficult to understand as I’ve never associated irony with the Christian faith, so I went to the several links to the subject below the post to see if I could understand the subject better. There I saw that each article was the same one, and I am wondering why that would be, as when I’ve done that for other messages on a single subject, each was slightly different. Perhaps the message is that we need to seek deeper than we have done so far, and far be it from me to provide an answer (if one is being sought) but perhaps we could focus on an unanswered posting, or so it was in the last of the homilies I looked at, that of May 2013, I think. The person posting was, if I remember rightly, OLT, and his basic problem was that God was not answering him in need. Everyone tried to help him, and he answered politely but was not convinced. I do not know if at another time that might have changed for him; many of the suggestions were well meant; others were searching with him, Father as well. To connect with the subject of this post, I was reminded of the story of Job – it’s a hard one for me to work through as Job’s comforters and Elihu at the last seem so close in what they are saying but Job persists – he will not be satisfied until God personally answers him. I thought that was a good point of reference. And then I thought, if there is irony in the story of Job, it is both in Satan’s ‘skin for skin’ remark and in God’s claim that His servant Job has answered Him rightly and is even at the last to pray for his comforters! With respect to these thoughts, I recently found an article by Father George Florovsky which underscores Father Freeman’s earlier comments on OT significance thusly: “…It is only in the light of Christ that the Old Testament can be properly understood and its “mysteries” unveiled…” That is, in this case, why it was important for God to instruct that the comforters be prayed for by Job, who was insisting on a direct relationship with God. ( We ‘know that our Redeemer liveth’ – and that came from Job!) As Father answered OLT (I may have misremembered his name) it is in our relationships with one another that we most image God, something which is darkly reflected in the OT story. Allison’s of August 26, 2018 at 7:07 am is quite crucial! Should have done more homework! I’ve had far less time than usual to follow things properly here lately, due to the devastation we need to busy ourselves with after the deadly fires in our Greek neighbourhood. 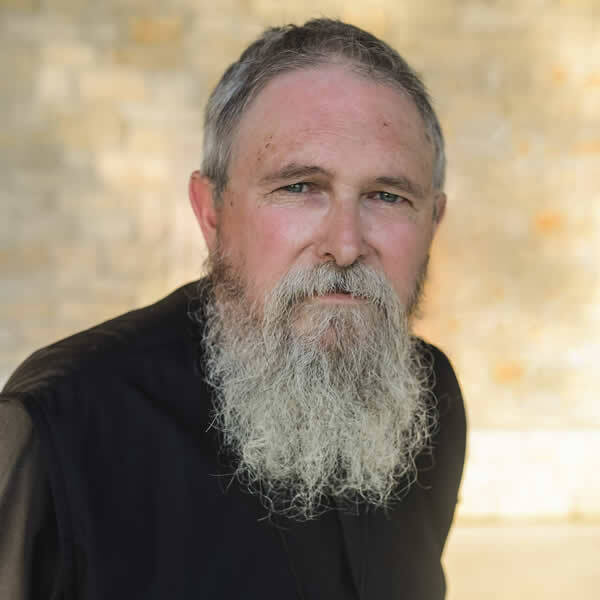 Since Dino mentioned the fires in Athens, I hope you would not mind (and if you do, please delete this comment) if I post a link to my fundraiser to help the monastery and orphanage in that neighborhood that was destroyed. You were so kind and generous in sharing it on Facebook, I had great hopes that it would generate some donations (hopefully many and small). But after a couple of them that happened immediately, the Facebook post was quickly forgotten, as it happens with that media. I have shared the fundraiser with some of the friends who post here and many have responded most generously. But maybe just one more will result from my request here… Thank you for your earlier help, and permission to share now. And thank you to all who donated and might donate. You are in my prayers and grateful thoughts. TLO was John’s nickname for “The Loyal Opposition”, and you are right that he had a lot of questions and objections. So many people tried to help him, and I personally benefited from reading their comments years later (in 2013 I did not know about this blog). John passed away a couple of years ago, so now we pray for his soul – hopefully he made peace with God before he was called to present himself before Him. Thankfully our loving Lord accepts our repentance even at the last hour…. I wasnt around the but I have learned that TLO was a beloved member of the group. Thanks Agata for pointing that out to Juliana. Simon…me too, heard the same…and remember reading his posts. While I may harbor some pessimism about certain things in life, I am an eternal optimist when it comes to God’s loveingkindness. I do not know what repentance looks like in another’s heart, but what little I know, I believe that TLOs “effort” at repentance, all that he could have given with what was given him, we saw a portion in his words here at the blog. I have little doubt that he is forgiven. Sounds quite presumptuous, but it is presumption in the goodness of God. Since we are told of a purging and cleansing Fire, I pray for all the departed…and I stand on God as the Giver of Life. I think we are never wrong to presume the goodness of God, His mercy, forgiveness, kindness, etc. This life is not a proving ground, I do not think. It is, above all else, a confrontation with evil (however we want to describe its reason). In that confrontation, God is on our side and is at work to save us, rescue us, heal us. Is it ever right to tell a heart how it ought to feel, Father? Listening and emphasizing non-judgmentally would seem to be humility’s approach. I love you, Simon. And don’t worry about the name thing. After ten words, I know when it’s you. God bless. Thanks Father…so true that God did not set us here only to stand back and watch the direction our “moral compass”, ever swinging in 50 different directions, waiting for us to get it “right”. If anything was proven to me it was that I need God to save my sorry soul. I’m always left with the thought…there is no reason on earth (truly) why I should have responded to God apart from any other fellow human being. I did nothing to deserve it, and should have been left by the wayside…but He didn’t leave me there. If I am so undeserving, yet for some reason responded to the Spirit’s “call”, and was given forgiveness, simply on the basis of His love rather than punitive justice (as Karen recently reminded me…the altar of sacrifice (the Cross) is also called the Throne…this is what justice looks like), then why not the rest of the sorry souls? That simple thought…it can not be shattered. I’ve tried to understand the argument for eternal damnation. But, the way in which I know God (what my heart speaks), I say no, it just can’t be! God’s love never-ever-ever, from ages to ages, fails! If God is who we think we know him to be, then hell as a place where the insolent go and then that’s it they’re there is just wrong-minded. Even my loathsome “dad” doesn’t deserve hell. In the context of boundaries, the ability to say “no” and really mean it in the follow through is important obviously. Simon it appears to me that you and I are similar I think in that we learn dialectically (to put another connotation on a word I overuse) – we are energized by the back and forth, we like to cut to the chase and push things to the logical conclusions (which is viewed, sometimes rightly, as “extremism” by others). It works, except when it doesn’t. Many people – most actually, don’t have the personality to engage you in this way. They learn by the middle road, more slowly and gently, and shut down at the extremes of “logical conclusions”. Others can teach you things more by what they do than what they say. Like any tool, the risk is overuse and trying to make every thing, situation, and encounter fit into your preferred strategy. Boundaries are also a two way street. If you are known as the guy who can start an argument in an empty room, well then you others will put up different kind of boundaries between themselves and you (e.g. avoidance, etc.) and then the relationship between you and them becomes all about boundaries and the ability to *listen* to each other is lost or never develops. That’s when people become merely their bad (or good) habits, or personalities, or political or ‘religious’ beliefs instead of real and actual people. In any case these are some things I have learned. I say all this not to disagree with anything said so far, but to add to it. As far as your comments directed to me go: Point taken. I can make almost anything feel like work. Got it. As far as setting boundaries by saying “No” means “No” and then following through. That is well and good for many people. My comments were really for Allison. Sometimes it can take someone time to develop the courage to stand up for themselves, especially within a religious context. My thought–and maybe I was mistaken–was to let Allison know under no uncertain terms that she is free to set boundaries–regardless of how arbitrary they might seem to someone else–and then insist that those boundaries be respected. Sometimes the emotional content of hyperbolic language can impart certainty and confidence to those that need to hear certainty and confidence voiced in their behalf. Therefore, I stand by what I said to Allison…unless of course it did not help her or made things worse for her. Another thought about saying “no” and healthy boundaries and forgiveness of all things.. Stephen Covey who wrote “The 7 Habits of Highly Effective People” would often ask in the audience in his lectures (not sure if this is in the book – it’s has been 25 years since I read it) if they could to firmly, steadfastly say “no” with real respect, gentleness, and “with a smile” at the same time? For example, in the context of parish life when someone comes up to at coffee hour and says “I am starting fill_in_the_blank project/society/effort and I need volunteers/money/time for this and this and this…” can you with authentically say “That’s wonderful, a really worthy project and goal. I won’t be participating. I look forward to your success in this important endeavor…”? Oh I agree 100% in the context of Allison’s comment and your reply. Your comment just prompted my general and tangential (to Allison) thoughts. More to the point, and I think Fr. Stephen has written on this in the past, our early 21st century Protestant/post-Protestant/Secular culture is highly “politicized”. Many (most?) in your parish don’t even know how to think about Christianity outside of a moral, political, context. They are limited by the given language of our politicized environment. Secularism is particularly adept at(indeed it is designed to) reducing almost everything to a “political” question, and all political questions are very important because they are all at bottom moral questions. Sooo, once healthy boundaries are established, I believe it is important to do your best to forgive people this *inherited* weakness and to see if you can figure out what they are really trying to say, or at least what they are really concerned and anxious about. This includes even priests, leaders and other “important” people as they suffer from this politicized environment just like the rest of us. Thank for your comment about binding the wounds of those who have been abused and your response to Paula at 11:47, Aug 27. I frequently hear platitudes of self righteousness as a response to others in situations which people are experiencing great difficulty. ‘This is not a proving ground. ‘ Indeed Glory to God for these words. This life is indeed ironic and bound in the mystery of God. Many of us suffer greatly and some do not. There was a time I wanted to ‘figure this out’ and I was ready to blame God. My own heart is vulnerable to such thoughts and I’m grateful for your words that would steer my heart from such darkness. If it were I’d be a Model T surrounded by Ferraris! I can be overwhelmed at times looking at the world, sick relatives, my own self. Yet when I spend time with Christ or in His word, all is brought back into proper focus. My wife was reading to me last night a little about AFR’s Kevin Allen who recently reposed in our Lord. She mentioned that he read the Akathist of Thanksgiving every day. I downloaded it and read it. I understand why he found such solace in it. Though he suffered as his body was wasting away, yet he finally attained the final healing at his death where his suffering was overcome, subsumed in victory. And Father, thank you again for the solace you have brought to me (and countless others) through the years. There is a softness to Orthodoxy that I very much have needed, indeed the softness and mercy of Christ Jesus. I tell you, if I can only remember to “look in the mirror” and recognize my own passions every time I begin to self-righteously assess others, maybe that would save the other person and myself from much grief and shame. Dean – I listened to the Akathist of Thanksgiving every night as I fell asleep for a few years after I first became Orthodox in 2005. I lost the CD in one of my many moves and have not replaced it. I keep saying I am going to order another copy. Thank you for reminding me! This recording is outstanding and I highly recommend it. Esmee – Is this the John Tavener composition? David – I have no idea. I only know what they tell you on the link and CD cover. It’s by the St. Ignatius Antiochian Church and is done with a service of small Compline. It’s quite beautiful and relaxing in my personal opinion. David – I just noticed that you can hear samples of it through that link underneath the basic information. Father – I followed your link. When I noticed the picture, it reminded of the first post that brought this blog to my attention. I have never forgotten that Solzhenitsyn quote and I know I never will. It grabbed my soul, which is why I have quoted it so many times over the years. I also remember reading your post and thinking that you might be worth following. I was am extremely devout Roman Catholic at the time. Tomorrow morning, I will get up at 5:30 a.m. so I can get my chores done and then drive for 45 minutes to get to the Divine Liturgy for the Beheading of St. John the Baptist. I will then drive 45 minutes back to work, have breakfast (finally! )(but no meat, dairy or cheese), and work late to make up for arriving late. And memory eternal, my beloved Solzhenitsyn. Thank you so much for linking the Akathist to this thread. I needed to read it — I don’t remember reading before but it’s praises now ring in my heart. Thank you, and Glory to God for all things. Thank you, Agata. I will do that next year. Since I am a near-vegetarian and I do not drink, fasting is hard for me. (I depend on eggs and dairy for most of my protein, so what do I give up?) I appreciate rules like this that provide me with a real challenge, which makes for a much more meaningful fast. *Her blessing: May the Grace of our Lord Jesus Christ, the Love of the Almighty Father and the Inspiration of the Holy Spirit be with you! In every step of your life follow the example of the Holy Virgin, Who will guide you, together with Archangels and Angels, like a heavenly Mother, so that you may love the mother who gave you life and raised you, offer love and joy to her first, then to all who come near you. * Forgive everyone and behold only the light of Christ, Whom we too shall be able to see some day, with the help of the Holy Virgin and all the Saints. * When we think of God all the time, then God also thinks of us all the time. * Never Identify a person with the wrong way they are treating you, but see Christ in their heart. * When thoughts of passing judgment on another person cross your mind, pray God to take them away at once, so that you may love this person as He does. Then God will show you your own faults. If Christ were visible, could you have such thoughts? * Keep your mouth shut in the hour of crisis, when a problem is acute. Do not say anything, because you may regret it a thousand times. Instead, tell it to the Angels so that they may place it at the Lord’s feet, and pray for an Angel of Peace to calm your soul. and joy to fly away. Agata – I failed. Do you have any idea how hard it is to avoid fresh tomatoes in late August in Southern Appalachia? Many thanks, Agata, for letting me know those important details! I actually was thinking that John had much of a resemblance to Job in his insistence on a personal encounter, so along with the loving replies to his posts I can now set the community’s prayers, as they complete the comparison! I indeed have much to learn from everyone here, as this blog has many facets of which I am unaware. Again, many thanks. I cooked the potatoes but managed to avoid eating any – but they never looked this good to eat as they did today! I was going to suggest to you (for the future fasts) a day of “juice fast”. Something similar to a “full moon diet”. Those kinds of fasts are very beneficial (there are lots of studies these days confirming health benefits of fasting), so why not do them on a fasting day? Fasting in today’s world is difficult, but I once heard Fr. Thomas Hopko say that fasting was always difficult for everybody who tried, even the greatest Saints struggled with it when they had very little to eat. Hopefully the Lord accepts even our smallest effort. I have often thought of the ontological argument for the existence of God as a divine joke. Within the parameters of grammar it makes perfect sense; indeed it is logically irrefutable. But it suffers from being transparently glib and has never converted a single soul. A form of godliness (or more precisely philosophy) without the power thereof. I might be bold enough to attempt to confirm the ontological reality of God. But I wouldn’t attempt to make an argument. This would be beyond me. An argument to affirm the faith existence of God seems to be pointless as it would seem odd to argue to corroborate the reality of my husband or my child. Such an act would be ‘objectifying’ someone I love. Sorry the word faithin the fourth sentence was supposed to be deleted. Indeed I agree with Lou regarding argument. But I’m not about to throw out the ‘ontological’ approach, which is what I attempted to reference. I’m just trying to be careful about what I’m referencing in my previous comment. 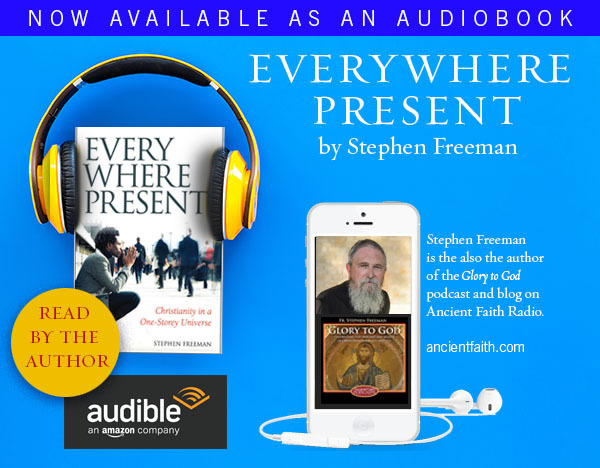 Fr Stephen has written eloquently on this subject on a number of occasions. I would like to encourage readers to search “ontological” in the search box. These articles are wonderful readings. From Moses to many folks on this blog, the testimony is overwhelming, yet rejected. The reason for rejecting the real evidence is simple–folks do not want to give up the delusion of control. He is. He lives with a love so ineffably great that He became as we are so that we can be transformed by who He is. It is simply my own intransegent love of my own petty will that keeps me from entering fully into that gift. Even so, I cry out from the depths of my darkness, Lord have mercy and He is merciful. Well said, Michael Bauman. Thank you. Michael I think that’s true for many. Another factor that plays into the rejection of the ‘witness’ account, is the promulgation of the two storey universe created by the western culture and western church. For some who believe they are atheists, if one listens carefully, they are frequently rejecting the two story universe. When I encounter such rejection, I consider the moment to be an opportunity to affirm that reality and if the listeners are interested, I might describe how the Orthodox Church has not been involved in creating such a perception. I’m not able due to lack of time to elaborate, but in this theme of irony and belief, I will note an observation and perhaps if you think it is helpful, perhaps you might consider elaborating on it. We have seen the results of modernity on belief in the western culture and churches. One such result is the continued fracturing of the denominations. What is opaque to us in the western culture is the overly casual acceptance of this norm and even ascribing to it some virtue of ‘democracy’. You have elaborated on this on several occasions. I see a relationship between the ‘horizontal’ fracturing of our perception of reality, that is across people in different places, geographically and socially and in denominations (glossing over a lot here, sorry). Yet also fracturing in the ‘vertical’ of which you have written in particular about the two story universe. In your following essay on ‘Love and Freedom’, this is relevant, because God lives in and is part of ‘our’ universe. This last point is where I see a disjoint for those of us who might regularly plum the vertical, whether it is down into the atomic level or whether we go out into the stars in our investigations. In either direction, there is God. However, it seems by virtue of the fact that in science we have yet to create a viable ‘unified theory’, there might be evidence of yet another result of this perceptual fracturing phenomenon. In the perceptual process in which we relegate God to an ‘upstairs’ place, we actively make Him invisible to our perception in the atomic level of our endeavors. To speak of such, appears to be a kind of sacrilege that ‘bends’ the proverbial ‘denominational’ rules. Such a rule might be: its ok to talk about God in these set of circumstances, but not those. To speak of God in those circumstances belongs to another denomination of beliefs, ‘which has nothing to do with the ‘real world”. So the upshot of what I’m attempting to describe here, is not just horizontal denominationalism, but also a sort of vertical aspect to the fracturing as well. are part of the universal church, the body of Christ. Fracturing, splintering, splitting…all have one result. Brokenness and confusion. Michael, evidence for God of belief that is purely testimonial is not evidence for God. Lets say that every night Jesus shows up where Michael Bauman lives. And lets say you fill up a bath tub full of water and you Jesus take turns walking on it. Later Jesus turns the tub full of water into wine which you sell and all the money you give to the church. And in your kitchen is a cookie jar that never runs out of chocolate chip cookies. Now maybe that serves as evidence for God to you, but does it really serve as evidence for anyone else? Doesn’t everyone else have good reasons to doubt your experiences? Evidence and testimony are poor substitutes for noetic knowledge. I think you’re right in saying people are hesitant to give up control. But basically we are always in control even when we are pretending we’re not. Submission to God is an act of control. Resistance to the passions is an act of control. But lets say I agree with what is implied by your idea of control. Then I am going to be in control until I submit myself to God and then he is in control. When is a person whose noetic faculties haven’t been healed/opened going to know when to do that?? Without noetic doesn’t a lot God-tall seem like non-sense? Personally, for me, evidence for God and even evidence for the resurrection seem to miss the mark. Thank you for your response. Since I actually haven’t exposure to Christian denominations (other than from the ‘outside’), I haven’t seen how they might treat the creed. What you describe is very interesting. If we were to focus only on translation changes we might not have an objection. For example, the meaning of ‘Catholic’, includes ‘universal’. But as you point out, the human context, that in which the presentation of the creed is spoken, is what provides these words their actual meaning in usage. In the case you describe, the selected word ‘universal’ generates an abstraction and allows for the acceptance of the vast variety of churches and their varieties of theologies we actually see. Such an abstraction, obfuscates the continuity of a specific history of single (and tangibly real) entity referenced. Instead, it endorses the smorgasbord of all possible iterations imaginable that man could create, irrespective of the historic and real ( i.e., Orthodox). I encountered evidence, without actually looking for it, of the ontological reality of the resurrection. So what? Who’s going to believe that and does this actually miss the mark? So I guess this evidence is apparently what I needed to have–but I reiterate, I wasn’t demanding it, nor was I consciously looking for it– I just didn’t have the ‘eyes’ to see otherwise.–So I was given a ‘pair of glasses’ to correct my vision. I guess I should have been more explicit but I’m running out of time. In my last comment I’m referencing different types of eyes that we have. Eyes of the heart and eyes of the mind. The former are noetic eyes that see Christ without needing their minds’ eyes to see Christ. It seems Christ needed to reach me first through my mind’s eyes in the form of evidence, before I could realize the reality of Christ in a nascent noetic vision. I dont know what evidence would even look like anymore. As ironic as it might seem given my previous comments. I sincerely believe you’re in a very good ‘place’. God bless you, dear brother!! Interesting reflection. I think there is, indeed, a fracturing of the vertical as well. Sometimes, when I’m trying to get past all the cultural baggage that surrounds our thoughts about God, as a thought exercise, I think of the universe in something like a pantheist mode (“everything is God”). Everything is not God – of course – but I often think this is (as errors go) is closer to the truth than many of the habits of our modern thought. The universe is not God – but everything around us and the unfolding of all things is a manifestation of the Divine Energies – the revelation of God’s Providence. God is known primarily in His energies, the Fathers say, not His essence. So, contemplating creation and providence are actually a very proper way to think of God. Thinking of God apart from creation is where I think some of the trouble begins. There is no creation apart from God – and in that He makes Himself known by becoming a creature among creatures, I’m not sure it is right to say we ever know Him apart from creation. Modern translations and Bernstein’s operetta change it into “We will make our garden grow.” But I double checked the French, and it says, “Hoe our cabbages.” Not a glamorous garden, but the simple, back breaking, repetitive work of producing the most humble of peasant vegetables, cabbage. As a teen, through the work Voltaire, who is famous for his attacks on Christianity, I found the answer to life in Christ–live small. As Father Stephen said in “I’ll Be Small for Christmas,” ” God does not want “noble” souls – He wants real souls, doing real things, loving real people, dying real deaths. Thank you so much for your reflections, Fr Stephen. I’m grateful I’m not too far off base. And I’m grateful for the the Orthodox understanding of God’s grace in the form of His Divine Energies permeating through the universe. This provided a kind of relief for me when I first learned of it. And it encouraged me early on that following the Orthodox Way was indeed the way to go forward in my life in Christ. Lynne it is indeed amazing how Christ finds us and calls us exactly where we are. Now that is indeed Providential. Voltaire is turning in his grave!